This project ended successfully on 6/3/2015 02:00! ** VIP DONATION ** WOW! For your generous support you will be entitled to a PRIVATE BACK LANE TOUR WITH THE AUTHORS making you discover the real HK In Between +++ You get a special mention in the book (optional) +++ One of the only 5 original and numbered STAGs that are left and were part of the 4 unique happenings! +++ You get a signed copy of the book +++ A unique surprise from the IN-BETWEEN +++ and the Book launch Party Invitation! ** CORPORATE SPONSORSHIP ** AMAZING! You are the exclusive Hong Kong In Between SPONSOR! Your company/institutions’ logo will figure with special mention for sponsorship in the credits of the book +++ The authors will organise a private lecture event for your team on the background of Hong Kong In Between and their research +++ You will receive a package of 5 copies of the book signed by the authors +++ One of the only 5 original and numbered STAGs that are left and were part of the 4 unique happenings! +++ A unique surprise from the IN-BETWEEN +++ and an invitation for your team to the book launch Party where we hope to have the chance to meet you! 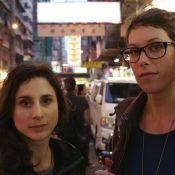 We are Geraldine Borio and Caroline Wuthrich co-founders of Parallel Lab. We do urban strategies, architectural projects and design but our obsession is how space does trigger the users behaviour and vice versa. We’re based in Hong Kong the city we chose as our testing field and place for exploring the spontaneous creativity that the urban density provoques in its inhabitants.